Jinxy Knows Best: Vegetarian BBQ Cooking - Free Cookbook! 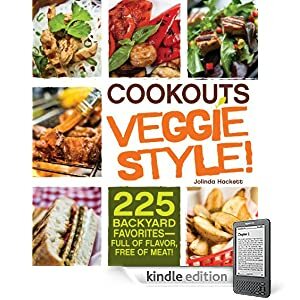 Vegetarian BBQ Cooking - Free Cookbook! It's 4th of July weekend - time for cookouts and BBQs. There is no reason vegetarians can't get in on that fun! Cookouts Veggie Style! by Jolinda Hackett is available for FREE for download. The recipes can be used for charcoal or gas grills and vegan recipes are also included. Download it for FREE to your Kindle or other compatible eReader or to your PC/laptop.